The big news last week was about the news. Most alarming was the Fairfax announcement that printed newspapers as we know them will effectively cease to exist within a few short years. Many readers will miss the familiarity and romance of print. But more disturbing is the likelihood that the dignified authority of the Sydney Morning Herald and The Age mastheads will be lost when the more ephemeral, entertainment-oriented electronic edition is all we have. The comparative lightness of the online content is consistent with the increasingly widespread trend to blend news with entertainment in electronic and online media in general. In fact the appeal of this is such that many, perhaps most, Australians have their news delivered to them within a form of popular entertainment rather than ‘serious’ news publications and programs. It is often breakfast radio presenters such as Kyle and Jackie O who shape young people’s perceptions of the world with their mostly offhand and anti-social jokes about events and issues of national and world significance. Or the more socially responsible but nevertheless trivialising news oriented comedy programs such as Channel Ten’s The Project, as well as short-run series such as last year’s Hamster Wheel from The Chaser and ABC1’s current Friday offering Shaun Micallef’s Mad as Hell. These shows are influenced by highly successful and sometimes incisive American news comedies including The Colbert Report and The Daily Show with Jon Stewart. Such blending of news with comedy is the subject of a comment by Californian Jesuit James T. Keane in the latest issue of America magazine. Keane writes of the usurping of the traditional network news bulletins by the likes of Colbert and Stewart, who ‘deliver news wrapped in comedy, pop-culture references and often an ironic distance from momentous historical events’. Significantly he is not entirely disturbed by this phenomenon. He argues that it is naïve to assume that Walter Cronkite could be trusted to deliver ‘unvarnished truth’. Moreover he suggests the comedies provide a kind of antidote to the xenophobia and introspective consumerism fostered by network news bulletins. Mainstream news programs routinely report on the ways in which ‘our way of life’ is being threatened or destroyed and seldom acknowledge that such ways of life are unsustainable or contrary to the public good. It’s a positive that satire provides much-needed perspective on traditional news, and that it has moved beyond a niche to educate the masses to consume the news more critically. But regrettable that the iconoclastic tone of many of these comedians of the left lacks the values and moral centre needed to counter the xenophobia and play to self-interest of the network bulletins and the right-wing news entertainment programs such as The O’Reilly Factor on FoxNews. If Fairfax Online remains dominated by an imperative to entertain, we should hope that it finds a way of retaining the sense of values that have long given the printed broadsheets their authority. 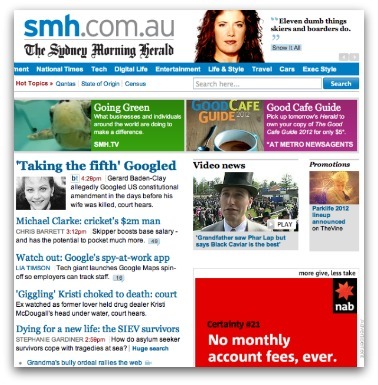 If my beloved "Sydney Morning Herald", in the future, is only available online I shall go into a period of deep mourning. And my morning won't be the same either. My experience with social media (specifically Christian blogs) has taught me a valuable lesson - that there is no substitute for real-life,face to face relationships in a Christian community. And likewise the serious broadsheet newspaper needs to stay in its current format. The Luddite has spoken. "News and Entertainment" is like muesli for breakfast after a lifetime of porridge (Serious news). It takes a while to get used to all the different tastes and textures but what kept me going was the belief - it is good for me, in the long run. So let it be with the changes in news media. Of course some mixtures are going to have too many nuts or caramelised fruit or spices but over time I will find a blend that I like and enjoy. I presume too "the men in suits" will be conducting market research to see what is selling and what is not and act accordingly. In the meantime, taste and see. Allthough, I class myself as an unapologetically ultra-progressive Christian, I have to admit to being of the "old school", if you like, on a few issues, and media would have to be one of them. For as long as I can remember, I"ve always had a fondness for the printed press, especially as my late maternal grandfather was, for many years, a printer himself. So like Pam, I, too, would be devastated if, in my case, "The West Australian", and also "The Weekend Australian" were soon to be available exclusively online. I acutually don't mind "The Chaser", but I can see where you're coming from, in that is does somewhat cheapen,and indeed trivialise issues of the day. We'll see what unfolds. Has anyone considered that the world may actually be running out of news? A world news shortage. Yes, we could be in the midst of a severe crisis. When more people are interested in whether Madonna flashes her breasts at a concert in Poland than whether thousands of people die from famine and war in East Africa, then I think it's time for action. Hi Pam, from a fellow Luddite - my beloved broadsheet is The Age. Rest assured, you won't be spending your mornings mourning alone. In 1978, airline boss Reg Ansett didn’t fancy employing the best qualified pilot because the pilot was a woman. She took him on through the Victorian Equal Opportunity Board and ultimately won. Victoria was a leader in human rights in those days. Sadly the current Attorney General is no defender of the rights of the weak and has gutted the Equal Opportunity Commission. It should be mandatory for anyone writing on asylum seekers to spend time visiting detention centres. Many commentators ignore the hard work of those who have. Moreover the politicians are too poll driven to even explain the human desperation that leads to boat journeys.